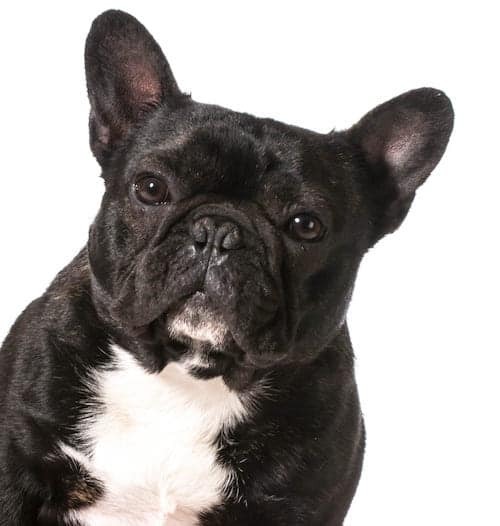 French Bulldog Temperament - Do You Know What To Expect? 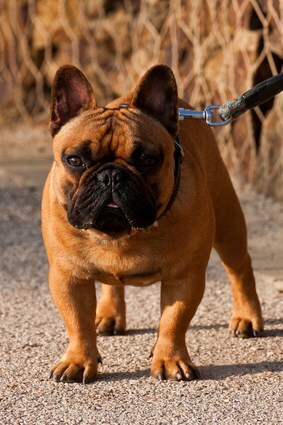 French Bulldog Temperament – Do You Know What To Expect? The French bulldog is a great choice for anyone looking for an adorable and intelligent dog. To deal with the French Bulldog temperament, you must first learn something about its character and personality. This will also help you determine whether this is the right breed for you. This breed can either be small or medium-sized and generally, they have a dwarf mastiff appearance. The French Bulldog is often described as a tough and compact breed which has made it a popular breed with many families. Certain French Bulldogs are aggressive, some are sweet, while others have an amusing personality and love to clown around. They are also affectionate and energetic and are known to form a close bond with other family members. Because of their temperament and the fact that most of their time is spent close to their owners, they can be very faithful watchdogs. French bulldogs are known to be easygoing and also have an amiable nature and temperament. They make a very pleasant companion for both children and the elderly. Devoting time to learning about your French bulldog temperament can be one of the best things you can do to build a better relationship between you and your lovable French Bulldog. When it comes to the French Bulldog temperament, this dog has a giant personality in a smallish doggy body. 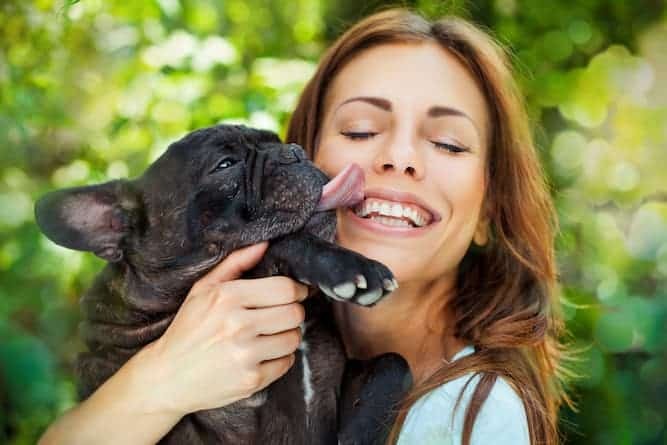 Frenchies in particular, when compared to other breeds, have a strong tendency to love their families as unconditionally as their families love them. Frenchies live for human companionship. 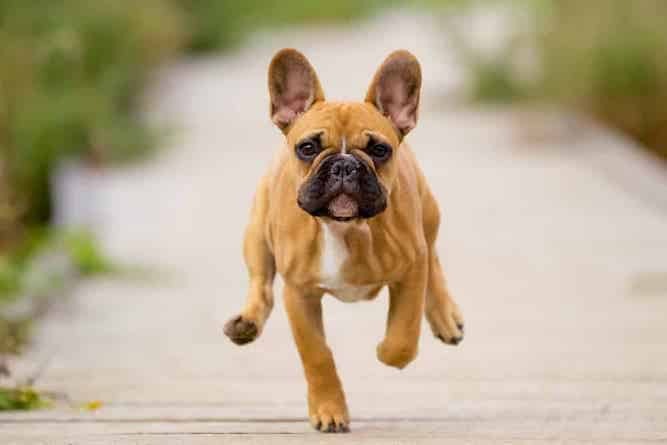 He may seem like a slow mover because he’s chunky, but the Frenchie can surprise you with just how lively he really is. He especially loves playing ball. After all, they don’t call him a boule (“ball”) dogue (“dog”) for nothing! He may bark to let you know a visitor is at the door, but otherwise, he tends not to get overly excited about anything. He’s a pretty chill dog. 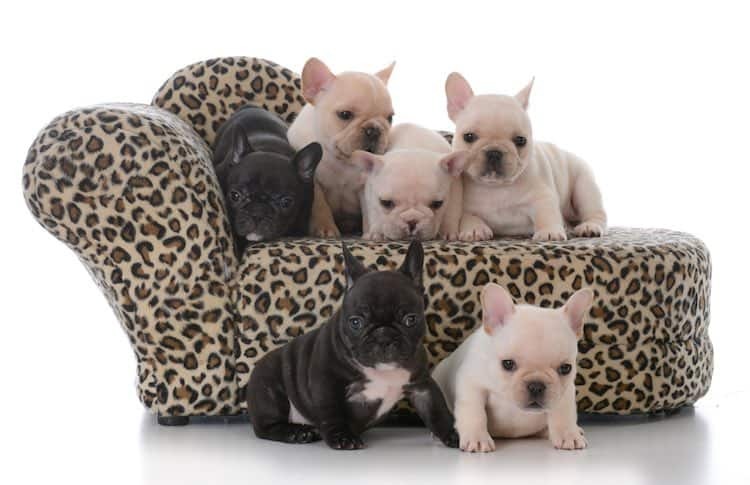 Frenchies tend to be calmer than other dogs during their puppy years. This makes training him a lot easier, even if his attention span tends to wander. Don’t get me wrong – training him is no walk in the park. But trying to train an excitable puppy who doesn’t want to listen is much worse than trying to train someone calmer. When it comes to petting, few dogs are keener than the Frenchie. If there’s an available hand in the room, he’s going to make sure it pets him. He is alert but not excitable nor overly energetic. He knows what’s going on around him well enough and just doesn’t feel like he needs to show it all the time. However, and this is important: you MUST supervise him when he is around a pool. His heavy head and body type make it impossible for him to swim, and he will drown if he falls in. He behaves himself well around new people and new animals alike. In fact, a Frenchie will think nothing of curling up in a new friend’s lap. Mi casa es su casa. One look at a Frenchie and you would be convinced that he is anything but Athletic. Also, This breed doesn't do heavy exercise. If he was able to breathe better, he might be able to do more. Otherwise, he’s happy with some light exercise. However, those that are in-the-know still consider him to be athletic because of his stocky build. So we'll let you be the judge. He can be a bit of a clown, and a troublemaker too. Whatever will get him in the spotlight and force you to focus your attention on him will work. He’s a smart charmer who knows how to work his magic to get the most amount of love in the room. Check out these two French Bulldogs going at each other. The French bulldog is an independent thinker and possesses a stubborn nature. You should, therefore, never tolerate or reward unwanted behaviors. It is vital that you show the dog good leadership and always be in control in case of any bad behavior. When training your French Bulldog, you should use a firm and strong voice to show him that you are the boss. However, never scream or yell at him because it will only make matters worse. 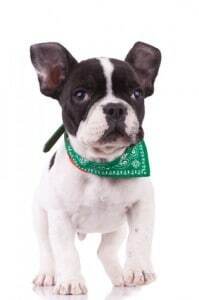 The other tip that you should adopt when dealing with French bulldog temperament, is to decide on a few praise words for good behaviors and some release words to signal the end of a French Bulldog training session. Each training session should not take more than a few minutes because the French bulldog has a short concentration span. However, you should be patient and understanding with your dog if you are to get the best out of him. It is a perfectly fine practice to carry some goodies around to reward your Frenchie for good behavior. Always look out for signs of aggression such as snapping, growling or snarling. Your French Bulldog can show these signs when they are trying to obtain dominance over everyone. To deal with this, show your dog that you are the boss and should be respected as such. You should let your dog know that they will never get away with any signs of aggression. Click here to learn how to deal with dog aggression. An aggressive French Bulldog temperament can manifest itself through excessive barking, but there can be other reasons for barking. In case your French Bulldog develops this irritating behavior, you should stop it before it goes out of control. However, you should first identify the cause of the excessive barking because sometimes it is for a good cause. Your French bulldog can bark excessively when there are intruders, danger, when it is hungry, stressed, afraid, angry, cold, hot, bored, lonely, want attention, isolated, excited or even when it wants to assert its dominance. Barking is a strong component of the French Bulldog personality. 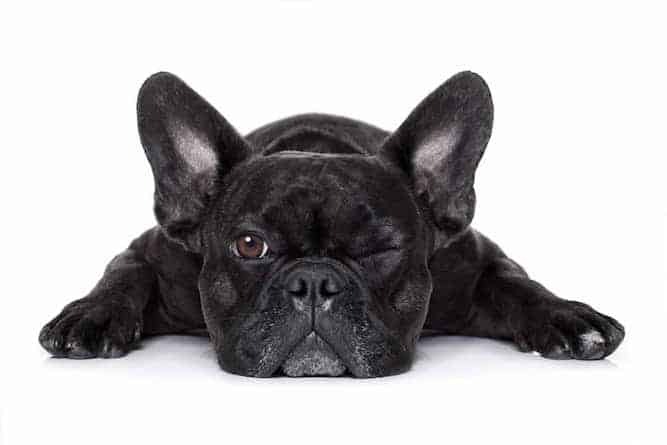 You may find yourself calling your French Bulldog names to get him to shush. Try to understand each situation and how to deal with it. If you cannot handle your French Bulldog’s temperament on your own, there’s a lot of good trainers and training resources that can help you. For help with training your Frenchie puppy look at The Online Dog Trainer by Doggy Dan. Doggy Dan is an expert Dog Trainer based in New Zealand. His online resource contains Hundreds of Excellent Dog Training Videos that will take you step-by-step through the process of developing a healthy, happy well-behaved dog. For the French Bulldog, shedding is not much of a concern. Brush him weekly to keep him looking clean and neat. General Good Hygiene – Wash the folds of your French bulldog’s skin after every meal. French bulldogs with white coat require more cleaning than their counterparts with dark skin. As far as French Bulldog colors go, their coats come in brindle, fawn, white, tan, and brindle/white. There is also another color of French Bulldog: Blue. However, the Blue French Bulldog though extremely popular in the US is not officially recognized. The Blue is also vulnerable to more health problems than other Frenchies. And speaking of rare French Bulldogs, there is also the French Bulldog Mini. While adorable, this dog is also is more vulnerable to the health concerns that can affect the breed. If you’ve been researching French Bulldog allergies, it is important to note that no dog is hypoallergenic, despite their marketing. While some dogs’ fur may not bother you as much, there is also their dander and saliva to contend with. The Frenchie doesn’t require too much exercise to keep him happy. Just a quick walk or a short play session in the yard is all he needs to keep him satisfied. Because he is a flat-faced breed, you should not exercise him too vigorously, as it can be tough for him to breathe. This is especially true in hot or humid weather. Also, for this reason, French Bulldog clothes are not an option in hot weather or while exercising. He already has enough trouble breathing as it is without overheating on top of that. The French Bulldog descends from the dogs that belonged to the Molossians, an ancient Greek tribe. From there, Phoenician traders were responsible for bringing the dog to other parts of the world. Eventually, one ancestor of these dogs evolved into the French Bulldog that we know today. Earlier Frenchies became the “it” dog to own, with everyone from socialites to Parisian prostitutes trying to get their hands on one. There are no records, however, that show the Frenchie’s evolution from the dog he was back then to the dog he has since become. A healthy French bulldog weight is between 20 to 28 lbs. for a male, and 16 to 24 lbs. for a female. And while we’re talking about body type, the average French Bulldog size, for a full-grown French Bulldog, is between 11 and 12 inches tall. Sometimes abnormal behavior can signal the onset of health problems in your French Bulldog. In such cases knowing your dog’s temperament well can quickly alert you to a potential serious problem. 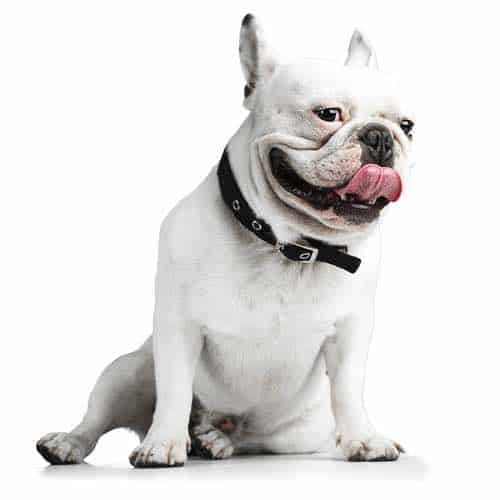 Hot and Humid Weather – this can cause heatstroke to the French bulldogs because they cannot pant vigorously to keep themselves cool. 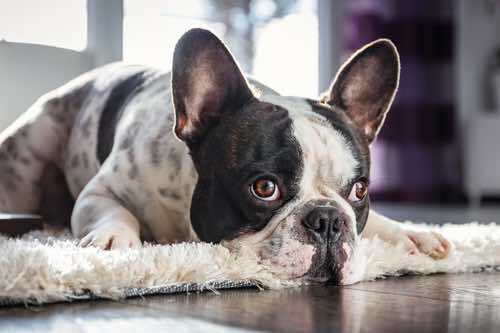 It is therefore advisable that you house your French Bulldog in a cool environments or air conditioned rooms because of the dog’s intolerance to heat. Respiratory Problems – Due to the health problems associated with their short face, you should keep your French Bulldog from freshly cut grass, smoke, allergenic pollen and chemical cleaning products in order to protect them from respiratory problems. Proper Breathing – Avoid dog collars which are known to apply pressure on the dog’s windpipe. This makes it difficult for the dog to breathe. Also important to note is that the French Bulldog lifespan for a healthy dog is between 10 and 12 years. As far as French Bulldog food goes, you can feed him the same thing as any other dog: kibble or wet food. The higher quality the food, the healthier he will be. Just be sure that he does not overeat, as this can lead to obesity which can trigger a host of health problems. So you've decided that you'd like to add a French Bulldog to your family. Wonderful! To do this, you should start by researching the French Bulldog average price and seeing if it’s a match for your budget. You can then decide whether you’d like to purchase the dog from a breeder or a rescue agency. The average French Bulldog price is between $1,400 and $2,000. The French Bulldog cost is so high because of how difficult it is to get them to breed. Their narrow hips make the mating process more difficult. If you’re interested in a French Bulldog rescue, you may be able to find one through your local animal shelter. A French Bulldog for adoption is your best option if you would rather get an adult dog or a French Bulldog mix. Adult dogs are better for those who are not interested in training a puppy from scratch, or who fear the destruction a puppy can cause. Remember each individual dog French Bulldog has its own unique temperament, this article is only a general guide for the breed itself. If however, you are considering adopting a dog you can read “5 Tips For Conducting A Dog Temperament Test Before You Adopt From Shelter” to get a more accurate picture of the temperament. A French Bulldog for sale from a breeder should come with all the certifications necessary to show that he has received clearance for health problems. If a breeder cannot provide proof of this, then the breeder is simply out for profit and doesn’t care about the dog. This typically happens with puppy mills and pet stores, which is why I don’t recommend buying a dog from either of these places. The French Bulldog belongs to the Non-Sporting Group. The breeds in this group are all over the spectrum when it comes to appearance, and their temperaments are equally diverse. Take a look at the following temperaments of other members of this group to get a feel for their personalities. Conclusion: Why the French Bulldog? The French Bulldog temperament can make him seem too big for his britches at times. You must be prepared to put in the amount of training necessary to make him more socially acceptable. This includes socializing him early and often so that he is well-adjusted around people and other animals by the time he is an adult. He can be stubborn at times, but he also loves to please you, so training him shouldn’t be too difficult. Grooming is not much of a chore either – a weekly brush is all he really needs. The French Bulldog life expectancy is between 10 and 12 years. And while most French Bulldogs are healthy, Mini or Teacup Frenchies and Blue Frenchies tend to get sick more often.